More changes on the way for Canada? Team Canada Executive Director Steve Yzerman said Monday that he respects the intelligence of Canadian hockey fans, but he also wants them to understand that just because a bunch of players have a maple leaf on their chest doesn't mean they are guaranteed to win anything, let alone gold. "I believe the majority of people in Canada have played the game, they've grown up with it and they understand it," Yzerman said. "I respect that, but we keep stating it and as evidence by the scores in these games in this tournament, the competition out there is getting better and better. Countries are improving." In this particular tournament, Canada had to go to a shootout to beat Switzerland and lost to Team USA. Slovakia upended Russia in a shootout and Germany gave Sweden all it could handle before falling, 2-0. Switzerland also played well against Team USA, and Norway played the Swiss tough. "We have stated it over and over that this is going to be a difficult tournament to win," Yzerman said. "These countries are good. The proof is there. They are excellent teams. We just can't go out and expect we're going to go undefeated and win a gold medal. We're living it. We understand that. Our players knew that coming in. I think the country has to understand as well that we're going to face adversity." Yzerman said Canada is disappointed about being in the qualification round with a 1-1-0-1 record, but not shocked by its predicament. "We weren't surprised by (Ryan) Miller's play or anything in the game (Sunday) night," he said. "We have a job to do. We have our own goals and expectations and we'll continue to strive toward those, but after all this time, after all this international hockey, people have to understand that these countries are good." Canadian fans expect only the best. "They expect excellence, and we expect the same thing," coach Mike Babcock said. "We're not trying to let anyone down." VANCOUVER -- Another game will bring about more changes for Team Canada, and these better work or else … well, you know what. The most talked about change is Roberto Luongo will start in goal with Martin Brodeur backing him up, but there's more. Rick Nash and Eric Staal will change lines. The Carolina captain will start Tuesday's game with Sidney Crosby and Jarome Iginla and the Columbus captain will start with Ryan Getzlaf and Corey Perry. The defense pairs are not as clear, but judging by coach Mike Babcock's words, it's possible that the top two -- Chris Pronger and Dan Boyle, Scott Niedermayer and Shea Weber -- will be split up. Germany may not pose a major threat to the Canadians on Tuesday, but provided Team Canada does advance beyond the qualification round you know Babcock wants to get his lineup ironed out before going into a game against the Russians on Wednesday. "If everything works good, you don't have to change it and if it doesn't work the way you want it, I think you have to change it," Babcock said. 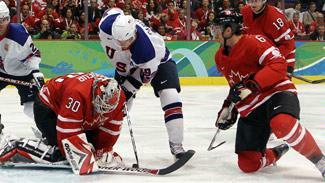 "In saying that, we had the puck a ton (Sunday) night (against Team USA). We had a lot of offensive opportunities. Overall, we're just trying to get better." Starting up front, Babcock believes Nash will help Getzlaf and Perry "get to another level." He reminded the media that Nash and Getzlaf played together at the 2008 World Championship in Halifax and Quebec City. They combined for 27 points (9 goals, 18 assists) in nine games. "They were real dominant on the cycle so that's part of the equation," Babcock said. In the back, Babcock would like to see Pronger get settled and play much better and he believes Boyle hasn't been himself either. We may see him switch to Pronger with Niedermayer and Boyle with Weber, but that remains to be seen. Drew Doughty and Duncan Keith appear to have decent chemistry playing together and Brent Seabrook may be locked in as the seventh D-man. "Prongs said it himself, he's got to get better," Babcock said. "The ability to lead, especially as a veteran player, always comes after you get yourself looked at first. That's real important. "(Boyle) is just an instinctive player who just plays the game, and I think he's probably been doing a little bit too much thinking," the coach added. "He can do that in practice. Just play the game. Play the way you play. That's why you're on the team. It's a change for him, it's a big stage and I think he'll be fine. He'll get better, just like we all will." The Canadians expect at least that much of themselves. "The more you get into this tournament … you stop thinking and you just start playing and reacting," Executive Director Steve Yzerman said. "I sensed that particularly in the last game -- that they were just playing." Contact Dan Rosen at: drosen@nhl.com.